Scott works for Cubicle 7 as line developer for World War Cthulhu. 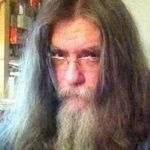 In his spare time he is a freelance writer and editor who has worked on a number of roleplaying games that have Cthulhu in the name (including Call of Cthulhu 7th edition) and a few that don't. He is also one of the presenters of The Good Friends of Jackson Elias, a podcast about the Call of Cthulhu RPG, horror films and horror gaming in general. Scott lives in Milton Keynes, which he assures you is a much nicer place than you may have been told.